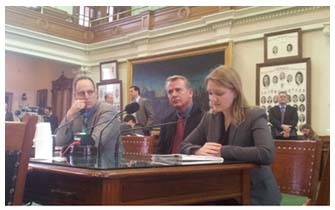 Construction industry leaders, associations, labor unions and others testified before lawmakers in Austin last week that the state needs to aggressively go after companies that misclassify their employees to avoid paying payroll taxes. Leaves the current common law test definition in place for independent contractor. Imposes a penalty of $100 for those in construction that misclassify their worker for the first time. Imposes up to a $1,000 penalty per employee, for each subsequent violation (this amount will be determined by the Texas Workforce Commission on a case-by-case basis). Allows an employer to appeal a violation and get the violation removed or get the penalty reduced based on certain criteria. Requires the Texas Workforce Commission to submit a report to the Legislature about its efforts to curb misclassification of construction workers. Todd Hewitt, a roofing contractor, told the Senate Economic Development Committee that companies that properly classify workers are at a competitive disadvantage because of the practice that's rampant in construction. “It displaces unemployment taxes onto me,” he said. John Hinson, Division President of Marek Brothers Systems in Dallas, said Carona's SB 676 gives the Workforce Commission the tools it needs to go after those who skirt the law. “All it does is it punishes the violators,” he said. “Right now there are no fines. There are no deterrents if you get caught cheating.” Hinson also said the landscape will change for the worse, sooner than later, if the state doesn’t give the Workforce Commission a law with some teeth. “This is something we need to stop now before the rest of us legitimate contractors are forced to do it the wrong way,” he said. The Texas Association of Business (TAB) supports the bill, but has one suggestion; they'd like to see money collected from fines that are levied go toward replenishing the Unemployment Insurance Fund. Vice President of Governmental Affairs with TAB Cathy DeWitt said that would be a “good way to help employers who are doing it the right way.” The Workers Defense Project in Austin echoed that point. “Those additional costs to recoup those funds are paid by companies that are playing by the rules,” said Emily Timm, Policy Analyst with Workers Defense. The bill was left pending in the committee.